The Energy Blog: Are Biofuels Sustainable? Robert Anex, left, an Iowa State associate professor of agricultural and biosystems engineering, is leading several studies to determine whether a bioeconomy that produces fuel and chemicals from biorenewable resources will be sustainable. One study found an integrated process for producing ethanol from plant fiber could recycle plant nutrients back to the soil. Innovative bioconversion processes configured to recover key plant nutrients from biomass will allow recycling nutrients to crop fields, thereby closing nutrient cycles and reducing the energetic and economic costs of fertilization. Such advanced bioconversion matched with complementary biomass production may promote the development of highly productive agricultural–industrial systems that protect environmental quality. 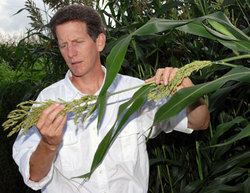 "It may well be that the development of biomass-based crops production systems can have as profound an impact on agriculture and its environmental footprint as it does on energy security and the global climate," Anex and co-authors Andrew Heggenstaller and Matt Liebman of Iowa State's agronomy department and Lee Lynd and Mark Laser of Dartmouth College wrote in a recent paper. "Whether this is a positive impact or a negative impact will depend largely on how biomass feedstocks are produced and converted, and the extent to which these two activities are integrated." The paper reports that as much as 78 percent of the nitrogen fertilizer needed for crops could be recovered from an integrated biological and thermochemical process that converts switchgrass to ethanol. The study says such nutrient recovery and recycling could significantly improve the sustainability of biomass production and the amount of energy required to produce ethanol from plant fiber. The researchers say the nutrient recovery could happen this way: Plant fiber would be converted to liquid fuels by pre-treatments and fermentation. The co-products of fermentation would be dried and heated to turn the solids into gases. The gasification would leave plant nutrients in the resulting ash and ammonia. The nutrients in both streams could be recovered and returned to the fields that produced the biomass. And that potential for nutrient recycling means there's potential for a new kind of agriculture feeding a sustainable bioeconomy. "The possibility of recycling nutrients from the biorefinery to the agricultural system that produces the feedstock may allow substantial improvements in both sustainability and production efficiency," the researchers wrote. The above post adapted from a press release by Iowa State University. It destroys soil, creates deforrestation, and uses massive quantities of scarce fresh water. That and it's so inefficient that even the worst solar panels trump the theoretical maximum limits of photosynthesis. Like Hydrogen, Biofuels are merely a diversion to maintain the status quo. Especially when you consider the next logical step is merely to make ACTUAL Diesel, and ACTUAL Gasoline, instead of fooling around with botique fuels. I would tend to agree with GreyFlcn. On the other hand, I believe in the scientific method and that good analysis trumps firm assertions, at least in the long run. A complication is that science has become quite circumspect in this day of Business As Usual and Above All Else, so a question would be, "Who is paying the freight for the research?" Once you know that then ask, "What benefit could they derive from certain findings from the research?" If the research is government funded by the Oil Administration, then assume BAU is in effect until future notice. Well theoretically Algae could potentially be done sustainably if you made it economical, and if it wasn't linked at the hip to coal power plants, where it merely temporarily shuffles fossil carbon. I don't see either of those happening. Much less a succession of Algae anytime soon. The bottom line is that the theoretical limit of photosynthesis is 11% solar efficiency. And thats before you get into all the gigantic thermodynamic losses involved with converting it into a liquid fuel, and the implications of it propping up our current CAFE standards which haven't been upgraded since the 1970s. And ultimately it just become subsidies to maintain the supply of liquid hydrocarbon fuels to Oil companies. Now in theory, in the long run, biofuels might make some contribution. But considering James Hansen says we got 10 years to take action on global warming. As John Maynard Keynes mentioned, "In the long run, we're all dead"
Which given the deadline we're under with global warming is all too true. So rather than waiting for castles in the sky, we should at very least put biofuels on the back burner with a mere retainer budget for R&D. And focus our public attention, dollars, and political attention on real solutions. Biofuels are not only sustainable, they are the necessary link back to a more biologically balanced, carbon neutral approach to solving environment and energy problems. I have never seen a solar cell as beautiful, efficient, and self-replicating as a leaf. I have never seen a solar array as multifunctional and self-replicating as a tree - one that (unlike photovoltaic cells) stores the energy it creates purifies the surrounding air, and provides such benefits as water purification, soil nutrification, habitats, and carbon sequestration. Trees and plants have been used as sources of solar energy for millennia before we veered off and started digging up their fossils to power our machines. Nature sequestered the fossils underground for a reason - and now we know why. Many of our environmental catastrophes - smog, wildfires, coastal pollution, groundwater contamination - have been caused by the fossil fuel paradigm. For one thing, it has disconnected us from our primal relationship with forests which are not scenic landscapes to be preserved but living ecosystems that need our restoration to mend the damage we have done to them. When they work they are beautiful - when they don't work wildlife dies. Our responses to public forest wildfire challenges have been pathetically underfunded. The biofuel paradigm shift will help enjoin private enterprise to create a energy solutions that are both ecologically and economically sustainable. Expecting the government to do it and then blaming them for their lame, underfunded efforts is pure folly. Efficient? Holy crap are you saying biofuels are efficient? Hell no. Lemme see, biofuel, or CSP. Hrmm which is more efficient? I'll take the one which yields over 12000% more net torque!!! As for the self replicating part. I've never seen a self maintenence, harvesting, processing, and delivering biofuel process either. Titanium Dioxide organic solar panels. Those do all the water and air purification you mentioned. Far more efficiently. The ammount of terrestrial biomass is tiny compared to what was primarily just algae and other ocean plants. And that had millions of years to accumulate. What you're proposing is that we replace what took thousands of years to make, every year, in real time. Thats not realistic. Much less if you take the faintest concept that it takes nearly 500 years to form new topsoil. It certainly isn't sustainable. Perhaps with the right technologies and practices it would be possible to wrest some broard environmental and economic benefits out of biofuels. However, where the case falls flat is on the energy security side. So now instead of your fuel prices being at the mercy of volatile Middle Eastern politics, you want to put your trust in the weather? If a cyclone flattens this years fuel crop what then? You will still need to maintain vast strategic reserves, and so long term storability must be added to the list of desirable biofuel charachteristics. As niche products for the farmers, great, but not as the mainstay of your transportation system. Yikes. My advice: if you want people to take you seriously, you shouldn't go around saying things that are complete nonsense. By CSP I assume you are referring to concentrated solar power. I have no problem with advancing PV technology. I think we will need every new source of power we can - fuel and electric - to substitute for energy created from fossil fuels. PVs are very expensive and thus require far more subsidies to be implementable than what is projected for biofuels. Torque is only a small issue to consider relative to the big issues such as infrastructure migration, vehicle design, energy storage, national security, and trade imbalance. I opt for the practical and implementable vs. the idealistic. Stop jumping the gun and wait and see what he comes up with first. There are too many numerous technological advances in all areas to merely dismiss the biorefinery out of hand. And the politico- influences, i.e. Ideology - too often does this and skews rational thought! There is absolutely no way that bio fuel which is produced by growth in soil is sustainable. A simple calculation, looking at the energy consumption of a small country like Denmark, will show you that you would need the entire land mass of Denmark (and then some), to be able to grow enough soil based oil (using the most effective species for their climate), to run all Denmark's transport alone. Perhaps if Bio fuel was created using algae to minimize water loss in closed systems, which scrubbed the CO2 from fossil fuel burning stations and fed on the nutrients of sewage etc. Then it would be sustainable. But I guess its better then using petrol..
And by the way, whats that tag on the back of Ocado delivery trucks in London anyway "we are as green as walking to the shop". Of course its better to walk to the shop!